It’s finally here. My debut fiction novel, Wilderness Rim – Echo Falls Book One, will be available for order within about four days, maybe sooner. Stay tuned here and on my Twitter and Facebook for when it goes hot and you can speed order it from Amazon. If you’ve ever smelled a Sasquatch, you know it reeks. But what really reeks for C.J. Phillips is that he’s 15 and his mother has more of a life than he does and her life isn’t circling around C.J. anymore. She even missed his parent-teacher conference. He’d be fine with that, but no one in all of Echo Falls -including his mother- seems to appreciate what he does, let alone who he is. Until he takes off for a wilderness camping trip and runs smack dab into Stinky, a teenage Bigfoot, whose own family is suffering, because of some mysterious barrels being buried in the watershed by environmental pirates. Together C.J. and Stinky develop a bond and eventual friendship that helps bring down an illegal dumping operation that threatens everyone – human and Sasquatch alike. We’ll be having a Sasquatch Debutante for this little creature on February 11 at The Black Dog Arts Cafe in historic downtown Snoqualmie. Everyone is invited — human and cryptid alike. I hope to see you there. Apparently there will be sugary snacks. And bookmarks. Also, the most excellent cover artist, Leslie Nan Moon, will be there with art work to view and procure. I’m trying to arrange a musical guest, too. More on that soon, hopefully. 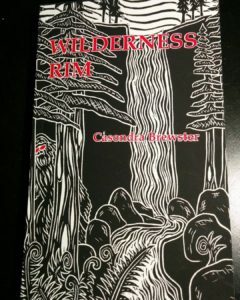 Oh, and copies of Wilderness Rim for purchase and signing. Please come and celebrate with me. Can’t wait to read this! I will be at the book launch on Feb 11th!